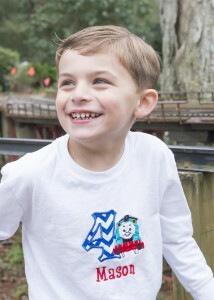 Mason is our beautiful, smart, sensitive, loving, blue-eyed 4 year old. Mason has Autism Spectrum Disorder, severe anxiety, and possible seizure disorder. We have had a long, exhausting journey with Mason, and we still have not reached our “destination.” Mason was the perfect baby boy we had been waiting for. He was the first grandchild on my side of the family and would be the light of everyone’s lives! He was quiet, a champion nurser, happy, content, smiley, and every other positive adjective you could describe a baby. He developed over the first year of his life, like any typical baby. We started to notice he was not babbling or attempting to speak. We just thought, “boys are slower than girls, he will catch up.” The progress never came. Mason always smiled, made eye contact, was affectionate, loved to be cuddled, was playful, and an all around happy baby. Autism didn’t even register on our radar. After all, he had none of the most common symptoms of Autism Spectrum Disorder. Then, we started noticing little quirks he had that we could not explain. He never played appropriately with toys. He would turn cars over and spin the wheels, trying to figure out how it worked, instead of rolling it around. He was exceptionally good at puzzles and building things, but seemed to lack any playful imagination. He didn’t dance and play like a typical toddler would. He seemed to have no interest in things that most toddlers enjoyed. Within the next few months we had him evaluated with Early Steps, to figure out what services he may need. He definitely needed speech, and we got him started right away at 18 months. It was a slow and rough start, but he fell in love with his therapist and quickly became eager to attend his speech therapy sessions. We also enrolled him in daycare at Kids Discovery to give him the socialization he clearly needed. He enjoyed going to daycare. He loved his teachers and his classmates. We didn’t know if we would ever hear Mason talk, so every tiny bit of progress was huge for our family. We were so excited over, what to some may seem to be the simplest achievements, every step of progress he made. We worked with the therapists so that his daddy and I could continue his progress at home. We knew it was as much our job as it was Mason’s to continue working to move forward and give him the best start we could. We welcomed Mason’s little brother, Tyler in June of 2013. It was quite the adjustment for Mason. Over time, Mason fell in love with his baby brother, little did he know they would have a lot more in common than we thought. Mason made slow, but steady progress over the next year and a half. When he turned 3 he was enrolled in our local ESE (Exceptional Student Education) program. This would turn out to be the best thing we could have ever had hoped for! Mason made leaps and bounds of progress with speech, interacting with his peers, and expressing himself effectively. We did start seeing staring spells with him, where we could not get his attention, he would not blink or move and when he “came to” he would seem to be disoriented and confused, trying to figure out what he was in the middle of doing. I knew a little bit about petit mal seizures and decided we needed to take him to be evaluated by a pediatric neurologist. Mason’s EEG showed focal slowing on the right side of his brain, which is indicative of a possible seizure disorder, and we moved ahead with a MRI. MRI showed no structural abnormalities. Medication was not indicated at this point, so we continue to monitor seizure activity. Mason was having trouble with coordination, balance, gross and fine motor skills. We started him in occupational therapy and had him evaluated by a physical therapist. The physical therapist suggested we get a trampoline to help with his weak core and ankles. It worked wonders. He still attends speech and occupational therapy, making steady progress. After a slow process and lots of testing and evaluations, Mason was diagnosed with Autism Spectrum Disorder. It was recommended we start ABA therapy as soon as possible. As soon as the paperwork was taken care of we started with ABA. As Mason continued to make progress and become more aware of his surroundings, and became more interactive with others, the anxiety started to rear its ugly head. He would cry over everything, have meltdowns over everything, he couldn’t express himself without crying. It seemed he would cling to familiar people, and even our family pet. Mason started having night terrors and it was heart breaking to see him wake up terrified. It was exhausting for everyone. Mason started asking for our dog, Dumps, to sleep with him. His sleep became more peaceful. We decided to let Dumps start sleeping with him regularly. If he does wake, he sees that Dumps is there, is comforted, and can usually fall back asleep right away. We noticed he was clinging to Dumps more and more. He was calmer with Dumps, and Dumps reciprocated the attention. Anytime Mason gets upset, Dumps will just walk over to him to check on him. Mason had always loved animals, but really clung to Dumps. His ABA therapist mentioned that he would greatly benefit from a service dog. Dumps couldn’t travel and go in public with us to have that calming effect on him. A service dog would be at his side providing that comfort 24 hours a day. As a lot of people do, Mason finds comfort in a dg that he cannot find with people. A service dog would have a calming and balancing effect on Mason. His negative behaviors that stem from his anxiety would be greatly reduced. Putting Mason on medication for anxiety, does not feel like the right course of action for us. We believe a service dog would be the comfort and companionship that he needs. Studies show that children with special needs that have service dogs have a significantly reduced incidence of bullying. Mason is incredibly smart and is very proud when he remembers directions and steps in a process and aims to please everyone around him. He would be a wonderful handler for a service dog. A service dog would provide pressure and comfort and deter self- injury. It will give him a companion to have everywhere to keep him balanced and calm in uncomfortable situations. A service dog will also keep him from wandering in environments that seem not to be threatening to him. We feared he would not have the easy and happy life we hoped for him. While it hasn’t been easy, we believe he is, overall, a happy child. We will never stop working to make things even better for him. Mason’s little brother was also just diagnosed with Autism Spectrum Disorder. We are currently continuing to undergo testing and evaluations for possible seizure disorder, as well as working on a diagnosis of Sensory Processing Disorder. Their amazing father, John, deploys half the year to dangerous parts of the world, just so we are able to pay the mounting medical costs of caring for Mason and his little brother. We will never stop sacrificing to give our children everything they need, but somethings need to get done before we can save the money to pay for them. We cannot tell you how grateful we are that you are considering to help us and Ady’s Army in raising the funds for a service dog for our sweet Mason. We believe this will greatly increase his quality of life on a daily basis, and feel more confident in himself and increase independence.